The technology used to make a mobile phone vibrate is now being stitched into a line of next-generation knickers and linked to a smartphone app. 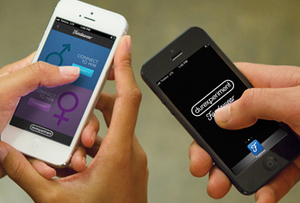 The result: 'Touch over the internet,' says Durex. If you thought that bum bras were weird enough, avert your eyes. Condom-maker Durex has released a new, high-tech line of underwear - Fundawear (oh, the punning genuis that went into that one) that allows those in long-distance relationships to 'tease, tickle and tantalise even when apart'. The vibration technology in the boxers, pants and bras is linked to a smartphone app, which lets users 'stimulate' specific areas at the touch of a screen. Speaking about the unusual undercrackers, Ben Moir, technical director of the project, said: 'After the laughter had stopped, we knew it was going to be an awesome project. And we can't see if catching on in the office. How long does the battery last in these things? Can you imagine asking your colleague for a charger for your bra? See below for the cringe-worthy video of young couple Nick and Dani trialling the networked knick-knacks on YouTube. Is the future more jobs for less pay?